A sewage spill that dumped millions of gallons of wastewater into the Tijuana River Valley was stopped at 11 a.m. Friday, the International Boundary Water Commission said. The failure in a sewage collection main in the city of Tijuana was reported Monday. Lori Kuczmanski, Public Affairs Officer for the IBWC said the flow was stopped and a meeting was slated for Monday, Dec. 17 to discuss the spill with Mexican authorities. On Tuesday, the Mexican section of the IBWC told the U.S. section an estimated 6 to 7 million gallons of sewage per day was flowing into the Tijuana River Valley and into the Pacific Ocean as a result of the break, the U.S. section said. 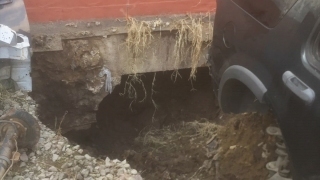 On Wednesday, the IBWC released images of what appear to be sinkholes on the property of an auto repair business in Tijuana. The agency claimed after the Tijuana water utility (CESPT) was notified of the sinkholes, workers diverted water flow from the business in the Colector Poniente in southeast Tijuana to a stormwater collector which drains into the Tijuana River. 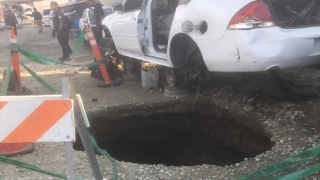 An image shared by the International Boundary and Water Commission shows a sinkhole in an auto repair business in Tijuana. 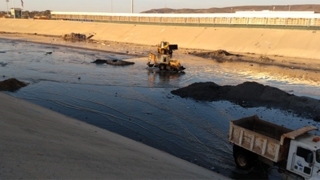 The IBWC said the reports of sinkholes prompted the Tijuana water utility to reroute water into the Tijuana River flow. This image was released by the International Boundary and Water Commission on Wednesday, Dec. 12. By Wednesday, the flow of wastewater reaching the Tijuana River had been lowered to approximately 4.4 million gallons a day, Kuczmanski said. The County Department of Environmental Health lifted the closure at Silver Strand and Coronado Tuesday, saying that the shorelines were not impacted by the sewage line break because currents were moving south. The DEH said it will continue to monitor water quality and will alert the public if anything changes.